A new study reveals that approximately 15,000 people die every year in this country from asbestos exposure. People may be exposed to asbestos through their jobs, typically from materials used in the construction or utility industries. Although there has been a substantial decrease—which began in the 1980’s—in the amount of asbestos used in products, the effects of asbestos exposure can take decades to appear. It is well-documented that asbestos exposure causes asbestosis (a chronic lung disease), lung cancer, and mesothelioma (cancer of the protective lining of the body’s organs). The study analyzed records from the Centers for Disease Control (CDC), from the years 1999 to 2013, of people who had died from either asbestosis or mesothelioma. 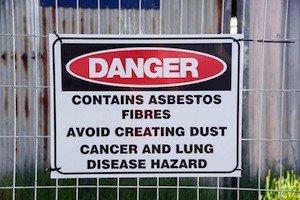 Researchers also included death records of those who had died from lung cancer which was linked to asbestos exposure. There were a total of 20,317 deaths caused by asbestosis during that time period. The total number of deaths from mesothelioma was 39,870. Deaths from lung cancer during that time were between 127,579 and 159,480. The study found that there were at least 2,000 to 5,000 more deaths every year from asbestos exposure than what had previously been reported. Asbestos exposure has also been linked to ovarian cancer, cancer of the larynx, colon cancer, and stomach cancer; however, those death records were not included in the study. A former assistant surgeon general—who was not part of the research group—says that if you considered the number of deaths caused by those asbestos-causing diseases, the number of deaths from asbestos exposure is much higher than what the study found. Dr. Richard Lemen also points out that several studies have found much higher rates of lung cancer in asbestos-exposed workers than what has been reported by government and other organizations, adding to an even higher number of deaths. If you have been diagnosed with a work-related illness, such as asbestosis, please contact an experienced Westport personal injury attorney to find out what legal recourse you may have against those responsible for your illness. For a free initial consultation about your case, call Attorney Richard H. Raphael at 203-226-6168 today.